Home bowling cricket t20 Who are the best T20 Bowlers in World Cricket? 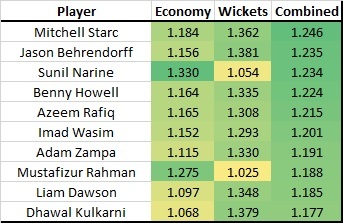 Recently, I looked at how we could rank the best batsmen in T20 cricket, comparing two existing rating systems and developing my own system to compare and contrast with the ICC ratings and the Cricket Ratings systems (here). Obviously though, there are two crucial elements to cricket though - batting and bowling. As with the batting rankings, this only takes international matches into account and arguably this top 10 might cause more arguments than the batsmen. 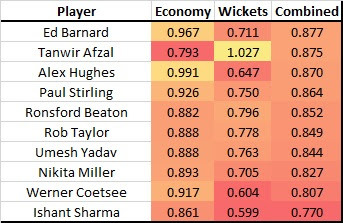 One of the hardest aspects of grading bowlers in T20 is deciding on the balance between the weights given to economy and wicket-taking. As the ICC mention about their rankings, "while taking wickets is still important in T20 cricket, the T20 rankings give more credit to a bowler for economy. A bowler that takes 0-15 off 4 overs gets more credit than one who takes 2-35. This weighting toward economy is perfectly valid, but if you are only taking the pure figures, one would therefore expect bowlers that bowl during the powerplay at the start and during the death overs to be overly penalised by this system. Indeed, we see that the majority of the bowlers in the top 10 of the ICC rankings are spinners that will bowl most, if not all, of their overs during the middle overs. Now, we see that there are only two bowlers that appear in the Cricket Ratings top 10 that also appeared in the ICC top 10 - Sunil Narine and Ravichandran Ashwin. Here, we see an increase in fast bowlers appearing toward the top of the list with Lasith Malinga, Mustafizur Rahman and Bhuvneshwar Kumar in particular rating highly. There are also a couple of unexpected names in this list. Benny Howell, Kevin O'Brien and Rikki Clarke are names that have performed well in the T20 Blast in recent seasons that might have gone somewhat under the radar. It is interesting here that there appears to be equal weighting given to wicket-taking and economy, which is in contrast to the ICC system. Now, my system is based on my T20 database that contains almost every T20 match played around the globe in the past 5 years for which there is ball-by-ball data. As with both the ICC and Cricket Ratings systems, my system takes two aspects into consideration - wicket-taking and economy. The economy aspect is based around the number of runs that a bowler concedes compared with the expected runs that an average bowler would concede on that delivery. For example, off the opening ball of the match, the average T20 bowler would be expected to concede 0.78 runs, while if he were bowling the final ball of the final over, he would be expected to concede 1.72 runs. By comparing what a bowler should concede with what he actually concedes, we can compare economy rates regardless of when during the innings the bowler was actually bowling. In addition, I adjust the expected runs based on the ground at which the match is being played and for the batsman that is facing the ball. For example, if you were bowling the first ball of the 19th over to Khaya Zondo at Queen's Park Oval, you would expect to concede fewer runs than bowling the same ball to Chris Gayle at the M Chinnaswarmy Stadium. For the wicket-taking aspect, I again compare the actual wickets taken to the expected wickets, taking into account once again, the batsman and the stage of the innings. For example, you would expect to take 0.024 wickets with the first ball of the first over of the innings, but bowling the last ball of the innings, you would expect to take 0.134 wickets. Similarly, you would expect that to vary depending on whether you were bowling to Virat Kohli or to a #11. Based on my ratings, Australia's Mitchell Starc is the best T20 bowler in world cricket. Interestingly, Starc did not show up in either of the previous top 10 rankings, but I imagine that plenty of people would not be surprised to see him near the top of the list. He performs well in economy and he is one of the most dangerous wicket-taking bowlers in T20 cricket. Another Australian, although less-heralded, Jason Behrendorff, appears second in my ratings, as he did in the Cricket Rating system. It would be interesting to see Behrendorff tested outside of the Big Bash and, at only 26-years old, there is still time for a franchise in another competition to take a chance on what would likely be a relatively cheap player. There is likely to be little surprise to see Sunil Narine rounding out the top 3. His economy rating is simply outstanding and his low wicket-taking performance is likely partially affected by batsmen simply looking to play out his overs without taking any risks. The trio of Benny Howell, Azeem Rafiq and Liam Dawson represent the T20 Blast strongly here and Dawson's performances have been rewarded recently with a T20 England debut. Benny Howell is a name that has appeared on both my system and the Cricket Ratings system and he is one that England should maybe keep an eye on. Strong performances in both the economy and wicket-taking aspects suggest that he is a very talented T20 bowler. This does not make excellent reading for India with both Ishant Sharma and Umesh Yadav, both of whom have played internationally for India and who are both regulars in the IPL, showing up in the bottom 10. Indeed, Ishant Sharma scores very poorly on both aspects, suggesting that he is expensive and rarely takes wickets. 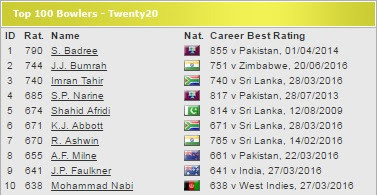 Regarding a couple of the other names that showed up highly in the ICC ratings, we find Samuel Badree at #13 in my rankings, Jasprit Bumrah way down at #123, Imran Tahir at #59 and Kyle Abbott actually shows up a long way down at #232, well below the average T20 bowler. Comparing a couple of names from the Cricket Ratings system, Lasith Malinga is at #23, Kevin O'Brien is at #51, Bhuvneshwar Kumar is at #57 and Ravi Ashwin is at #24. Generally, there appears to be slightly more consistency between my ratings and the Cricket Ratings rankings than with the ICC rankings.